A Nuviz is handy a companion for weekend rides. I'm a huge proponent of reducing any and all distractions while riding a motorcycle, scooter, or moped. Helmets and padded gear are great, but when you get down to it, riders are still just squishy people zipping through traffic next to giant machines that could kill you if a driver sneezes or decides to text a friend. So the idea of a HUD (Heads Up Display) for a motorcycle is equal parts intriguing and terrifying. Done right, it keeps your head up and eyes off your gauges and whatever navigation system you have strapped to your handlebars. Done wrong, and it's a one-way ticket to the emergency room because you were spending too much time going through menus and trying to find relevant information instead of paying attention to the car in front of you that just slammed on its brakes. A fender bender in a car is a annoyance. A fender bender on a bike could land you in the ICU. 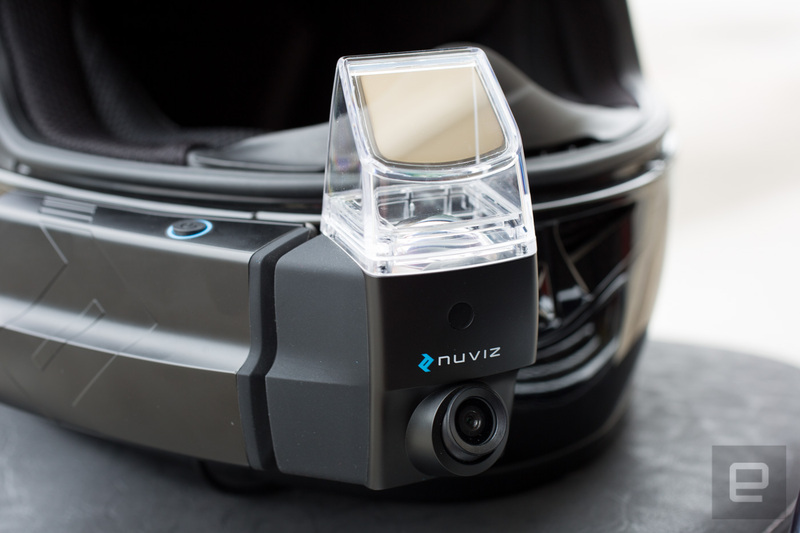 In comes the $700 Nuviz, a HUD for full-face helmets. The device's purpose is to keep you informed while riding without adding too much distraction that could lead to hospitalization. And for the most part, it succeeds. It shows your speed, navigation, maps, calls and your music via a tiny mirrored see-thru display that sits below the vision-line of your right eye. It's there when you need it and you can almost ignore it when you don't. To see the information about your ride, you peer downward at the display which is focused about 13.5 feet in front of you. That means you're refocusing your eyes, but the same thing happens when you look at your gauge cluster. Fortunately, the main screen is tailored for quick glances. 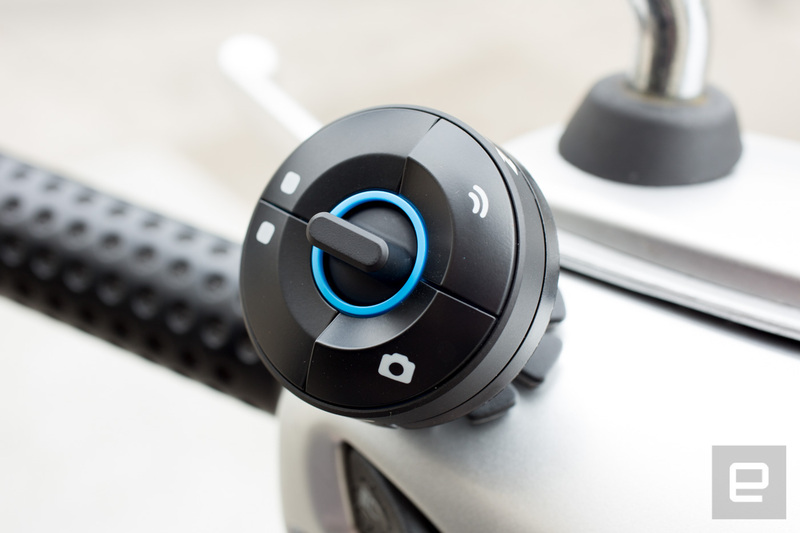 Your speed and next turn are easily discernible by quickly peeking downward without moving your head which is Nuviz's advantage over the dials that came with your bike. 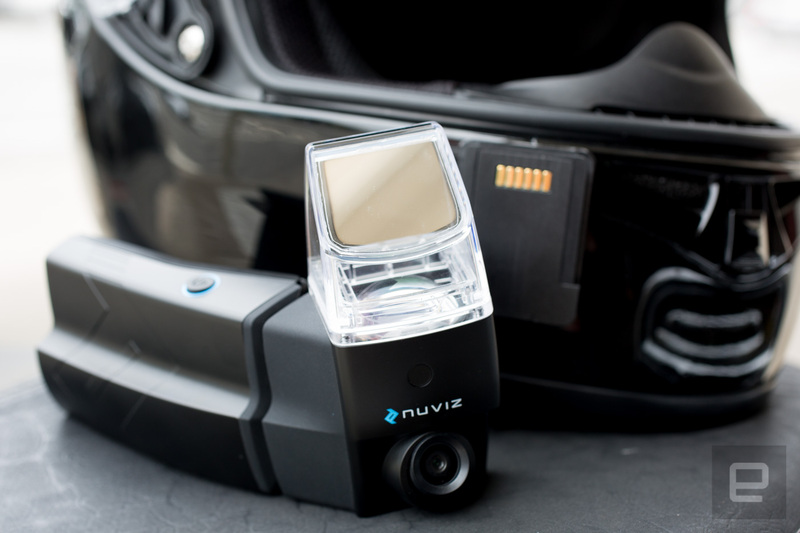 Plus, the Nuviz supports audio and comes with the headset that can be installed in a helmet or it'll sync to Bluetooth-enabled helmets. It's a bit of a multimedia experience right on your noggin. My apprehension about the potential for distraction intensified when I installed it on my helmet. From the outside, it's huge. And while its 8.5 ounce weight didn't bother me, for some folks with lightweight helmets, that might be a deal breaker. But when I actually put on my helmet all I saw was the tiny display which was a relief. Riding with the Nuviz also reduced my anxiety. With the combination or visual and audio cues, I was finally able to navigate to a destination without pulling over and checking my phone or attaching it to the mount I bought a few years back and have only used twice because I'm sure my iPhone will fall out of it and break into a thousand pieces on US 101. The display was bright enough to be legible in direct sunlight, although there were some tiny rainbow-colored dots that appeared in the glass. It wasn't enough to block the information, but it's there and while beautiful at times, it's just another thing you'll catch yourself looking at. Navigating the menu system was simple enough with the supplied controller you attach near your left handlebar. An up and down lever scrolls through the main features and it's surrounded by four action buttons. After a few hours riding using it becomes as second nature as activating my turn signals, high beams or horn. The controller is also how you turn on the device's 8 megapixel camera. With it you can take video and photos of your ride. The quality won't replace a GoPro, but the photos were good enough to capture deer in the brush next to the road. The 1080p video quality is reminiscent of a smartphone from five years ago. It's basically satisfactory and really the allure is that you don't have to stop and pull out a camera to capture a moment. It also might lead to gigantic slideshows, I took 100 photos during a ride around Mount Tamalpais. It's very easy to just tap the photo button on the controller while riding. Yet those are the kind of rides the Nuviz is built for. Long excursions on roads without heavy traffic. It was only during that type of jaunt that I felt comfortable turning on music (something I would never do while riding in San Francisco) and taking photos. The companion app makes creating a route with multiple stops that you send to the device a breeze and the actual navigation both on screen and in ear, was easy to follow without being overly distracting. The device and controller are both easy to remove and reattach to your bike and helmet so you don't have to check your bike every five minutes during lunch breaks. That also means you can ditch the whole system when doing short rides around town. In my experience, the Nuviz didn't add much value to my daily commute. I know where I'm going and the roads are for too congested to even think about using it. Plus, when it's attached to your helmet, it's never 100 percent gone. The tiny display, while helpful, is still in your peripheral. You sort of learn to ignore it, but when you're lane splitting (only legal in California) and keeping an eye out for one of San Francisco's many bike-swallowing potholes, you don't need another (no matter how small) distraction. But for weekend jaunts, the Nuviz is outstanding. It's eight hour battery life should keep you on your route for the entire day and it's on-board GPS and downloaded maps means even if you lose signal, you won't get lost. For Kawasaki KLR and BMW GS riders, it's a great little companion. But for daily riders in congested cities, it's best to focus on the act of riding.